Before you have a large gathering on your deck, give it a safety check! The summer has officially kicked off! Cookouts and outdoor gatherings will abound. Whatever the celebration may be, keep in mind the importance of maintaining and inspecting your deck regularly. Do this to ensure your event won’t be ruined by deck failure or injuries. 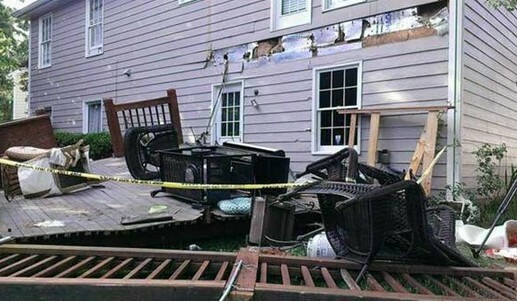 Since Memorial Day weekend, there have been several reports of decks collapsing around the country. In each instance there have been guests who were injured, some with broken bones. Better to be safe than sorry – take the time to inspect your entertainment area before your guests come over. Check your deck to make sure it is structurally sound. If you see anything that you are unsure of, or concerned about, you may wish to consult with a home inspector or contractor. According to two of the reports, rim joists and band joists, in separate accounts, connecting the decks to the houses had failed and pulled away causing the collapses. If the connection to the main support area is weakened and you add a shifting live load, the results may be very hazardous. See for yourself what can happen when decks are not maintained. In 2006, North American Deck and Railing Association (NADRA) dedicated May as Deck Safety Month. Decks are wonderful outdoor living spaces, but like anything else, they require maintenance and inspection. Age and weather elements contribute to the condition and longevity of a deck. Homeowners must be mindful of the dangers of a deck, especially during peak outdoor seasons. Check for any splitting or decaying wood, especially around the areas where connected to the house or building. Check all around the deck for any anchors, nails or screws that may be corroded or loose. All railings, staircases and banisters should be secure. Leaves and debris can cause mildew, along with other damage, to your deck. Be sure to clear these away. Check to make sure there is flashing to direct water away from any wood. National Lumber is able to provide you with top quality decking and railing products. If your existing deck is secure, but aged, you may consider upgrading the floorboards to give it a fresh, new look. If you do decide to build a new deck, we have a variety of materials to choose from. Things for you to consider would be the material, color options, cost and maintenance requirements. You can come into any of our 8 locations to speak with our staff about your decking project. Don’t wait til things topple over, we’re here for you!